One of my favorite ways to spice up my outfit during this time of year is with my accessories. For some reason, a white top and denim bottoms has been my go-to outfit lately. With this basic look, it's fun to add some color to my outfit with my accessories, especially with my earrings and purse! 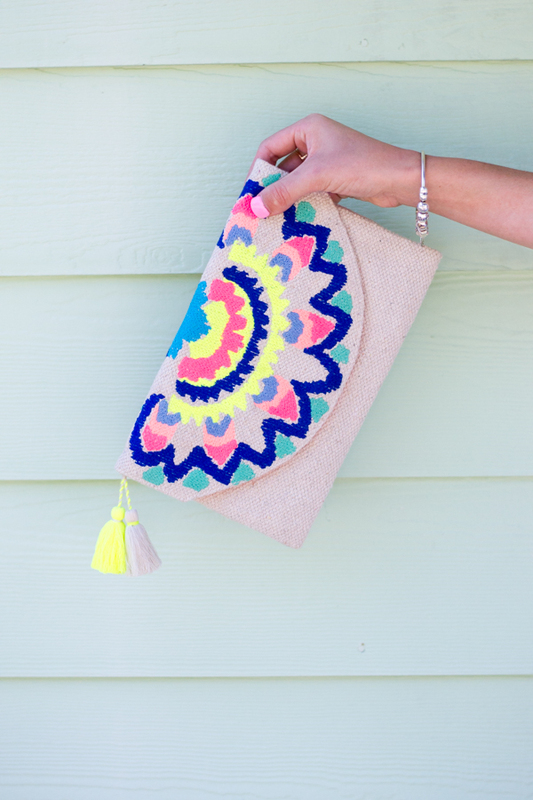 These earrings are finally available for preorder again, and how about this purse?! Target has been killing the purse game lately! These are my kinda outfits! Love an simple outfit with fun accessories. And can we talk about those earrings!? Amazing! Oh Target - how I love you! That top and clutch may need to be in my closet soon! I have this clutch and adore it! Perfect with your outfit too! Seriously so much fun to add accessories!! Love it!! Outfit is soo cute and perfect for summer! Loving those shoes right now! I love how you added pops of color to the white! So summery and adorable! Girl, this outfit is anything but basic. I'm super into that top. The bag and shoes are great, too! I love this outfit! I usually dash out the door and forget the accessories, but they really do make a difference! Love how you added pop up color clutch to your basic outfit. Pretty top! I adore this look! 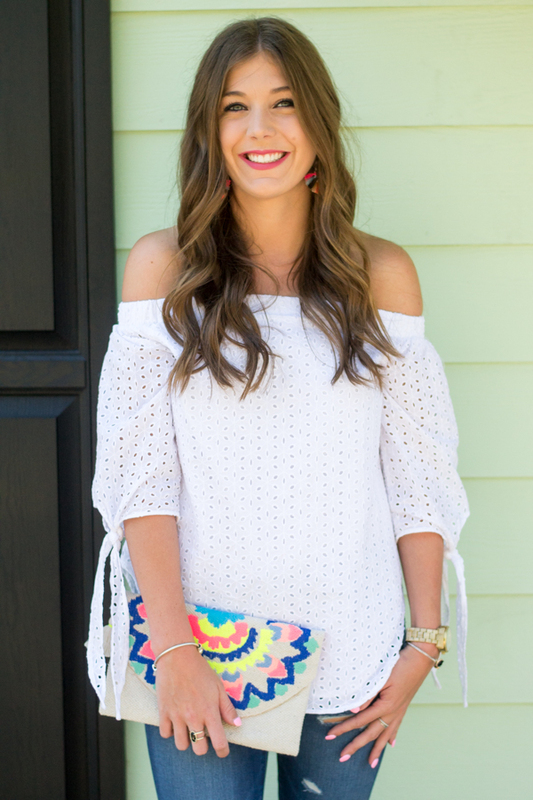 Your top is so cute and I love how you accessorized with fun pops of color! love your fun clutch, and i totally agree that accessories can make such a difference! Girl I am loving all these bright colorful accessories! It perfectly compliments your pretty eyelet top! So cute. It's true, the white would have been so less lively without that colorfulness. Thank you. I love eyelet anything! The fact that this is off the shoulder & eyelet, well, looks like we might have to be twinning yet again!! That clutch and those earrings are seriously the cutest! Love it! That clutch is SO fun! The perfect summer accessory! That clutch is adorable, I love this causal look. 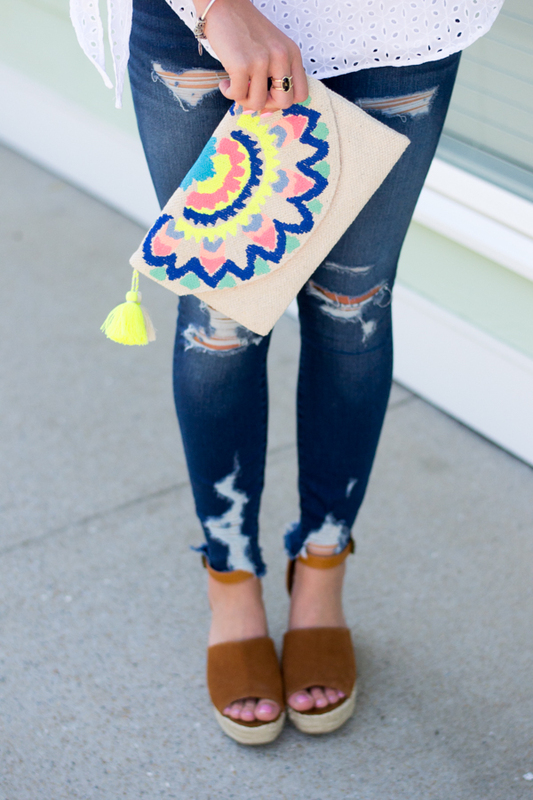 Love how you styled this look and that clutch is adorable! That bag is too good!